Retail $25.99 SAVE 5% ! Received these today and could not wait to start planting. These trees are perfect in shape and size and will go well with any other type tree. A great value for the amount and price. I recommend these for anyone wanting that instant forest! An entire forest in a single set! Great for use by themselves, or combine with larger trees to model a variety of scenes. 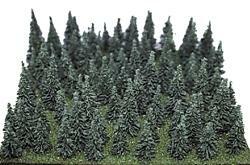 Pines are fully assembled, ready for use on your layout. These have no base so can be depth adjusted. I have a styrofoam mountain and they look very realistic on it. These are great realistic looking trees and several different sizes.